This approach doesn’t come without difficulties; towing often requires the driver to take a separate driving test to obtain the correct licence, and towing can be hazardous, as can carrying items in the back of a vehicle if they are not properly secured. Meanwhile, arranging delivery of a generator or compressor results in additional administration work, and equipment doesn’t always turn up on time, or might not even turn up at all. And if a separate compressor is used, the driver will need to ensure a fuel or power source is available on site. But there is an alternative: on-vehicle power. This involves a vehicle being professionally converted so that the power of the engine is used to drive auxiliary equipment. On-vehicle power systems can provide compressed air, electric, hydraulic or high pressure water jetting. And, compared to the traditional approach of using separate plant to provide power, they offer many benefits. Importantly, vehicle utilisation is significantly improved. Employees essentially drive a mobile work station; they will have everything they need to carry out their work within their vehicle, especially if racking, workbenches and lighting are fitted too. Employees also benefit from a cleaner working environment because of lower exhaust emissions, as well as safer working conditions due to reduced operational noise levels. Winton on-vehicle power systems operate at only 72dB(A), which is well below the level at which employers must provide hearing protection and hearing protection zones. When choosing an on-vehicle power provider, we recommend comparing life cycle costs (including vehicle fuel consumption) and the service offering. But there are some important legal requirements to be aware of too. On-vehicle power systems should be installed and certified in line with manufacturer guidelines and, where applicable, to EUWVTA UK National Small Series Type Approval (NSSTA). Type Approval means the vehicle installation conforms to current legislation, meets legal requirements and will add value to the vehicle resale in years to come. It’s also important to consider the impact a conversion will have on payload. 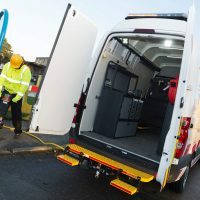 There has been growing pressure for equipment installed within a vehicle to be as light as possible, most notably because of the introduction of Euro 6, now a mandatory requirement for all new factory-build light commercial vehicles. The extra technology that is being fitted to meet the new emission regulations results in the base vehicle becoming heavier, potentially eating into payload capacity and increasing the risk of a vehicle being overweight. In response, we’ve reduced the weight of our core driveline power take off (DLPTO) system considerably in recent years, through implementing practical innovations such as replacing steel with lighter materials including plastic and alloys. The structure of the drive gears has been reconfigured, and lightweight cabling has been introduced – all with the aim of attaining a lower total weight, but without compromising the integrity of the system or undermining quality. We also offer a compact engine mounted system for both front and rear wheel drive vehicles, where the on-vehicle power system is installed within the engine compartment to reduce the overall vehicle weight and increase payload. We always weigh systems when they are fully installed; this ensures that the true weight of all fittings, oils and any ancillary equipment the customer requires is properly captured.